Neutra VDL's new director Sarah Lorenzen called me up and asked if I could help stop the incredible decay of an architectural treasure, Richard Neutra’s own residence called VDL Research House, named after Dutch philanthropist Dr CH Van Der Leeuw, who loaned the initial money to Neutra to build his own house in Silver Lake, California, the year was 1932. I said I would love to help if I could unleash my trebuchet on the high-end modernism freaks, buying and selling mid century wannabe estates without knowing where it all came from and what it advocated. We met on a rainy day at the house, with gray skies making the place look particularly in need of help as she and group of her students from Cal Poly, Pomona architecture department were giving tours for ten dollars per person to pay up some immediate bills for the house that were due. I have been looking for a causeful piece of architecture to write about. Architects near and far have been sending me pictures and links to their business web sites, announcing that their new project arrived with green media room, green his and her baths, and green gourmet kitchen, offering me the exclusive coverage for it in black ink. Nice way of saying, I don’t want to. VDL Research House particularly fits my description of a building I want to write about. Besides being the architect’s own residence, this is an experimental live-work house ahead of computer age, a place resonating with story after story through its walls. And, what cause is better than helping to save this important house, which influenced the whole genre since its construction? The historically seminal house, located 2300 E. Silver Lake Blvd., is in high levels of decay and there isn’t enough help to save it, as of now. Silver Lake neighborhood is located in the heart of Los Angeles with a recorded modern architecture pedigree, and Los Angeles often tells the world about its fatherhood of so called mid century residential architecture that takes full advantage of the friendly climate and the economy of simple lines, advocating modest life styles, minimizing consumption, in its real purpose and message. Since it is open to the public, the Research House’s dire conditions are no secret. The design magazines know it, speculative real estate community knows it and architectural community knows it. Or do they? I am not sure. They should. Here, I notify. I wouldn’t elaborate on it at this finger pointing tone, but this is a city where you hear the words “inspired by Neutra” in various forms and places such as architects’ web sites, in countless design blogs, in real estate ads and of course in the circles of armchair design writers. Pages of coverage, with wall to wall color pictures, for so called Neutra inspired specialists, when they re-build or renovate million billion dollar properties, like the architect and his pupil did years ago with clear aluminum sash and placed the glass in the right place. But, they don’t mention the VDL House, where it was all dreamed up and put to experiment. Since the house will never be sold to a private investor, nobody really cares. It technically belongs to the state, therefore public, yet the public only cares when they are informed about it. The people don’t know who Neutra is, let alone the house was designated a “World Monument 2000” by the World Monument Watch Society. Unfortunately, VDL2 House fell into Watch Society’s 25% failure rate even though the house is located in one of the richest regions of the world. Not knowing Neutra is not a crime. No. But a society who is desensitized or indifferent to architecture or uninformed about it, is ultimately indifferent to environment around itself, and ultimately indifferent to the quality of life architecture tries to impact in a positive way. We cannot let that be the norm. 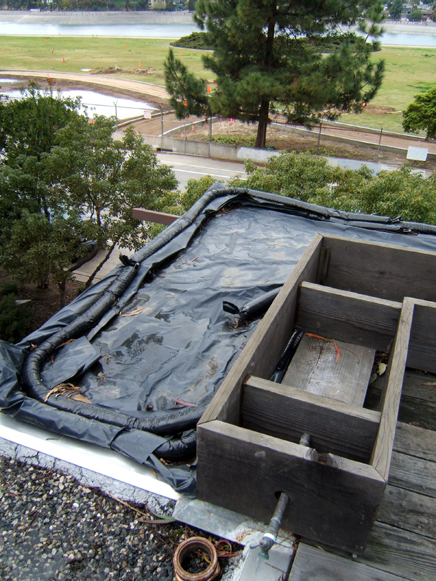 The roof is giving away after forty two years, and the Research House is leaking terminally. Hereby, I would like to ‘inspire’ some civic duty to save this rare house that remains open to the public. She looks at me like, no surprise... She, as the resident director, and her husband are living in the garden house and probably are used to talking the deceased owners about this and that. It is just that kind of a place, layers of Neutras, you know they are there. When the house was built, it was only 100 ft. from the lake. The reservoir, since then, receded back and East Silver Lake Blvd. widened and became a high-speed throughway. In its early days, when built during the Great Depression , the front portion of the house was used as the architect’s office, where apprentices like Raphael Soriano and Gregory Ain crashed in the basement and, when they woke up, ate breakfast in the garden before hitting the drafting tables to meet their boss’ deadlines, I speculate. 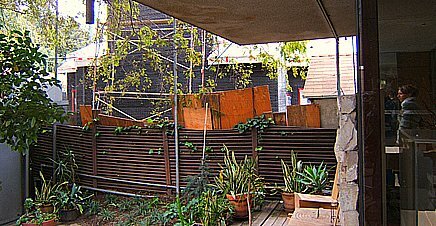 In 1939, Neutra bootlegged the garage, but really the Garden House , and got some privacy from the kids, including his own. Mrs. Dione Neutra lived in the house until she died. She left the house to an architecture school, California State Polytechnic University, Pomona. The house was donated to millioner Cal Poly San Luis Obispo’s poor brother, Cal Poly Pomona Architecture School. 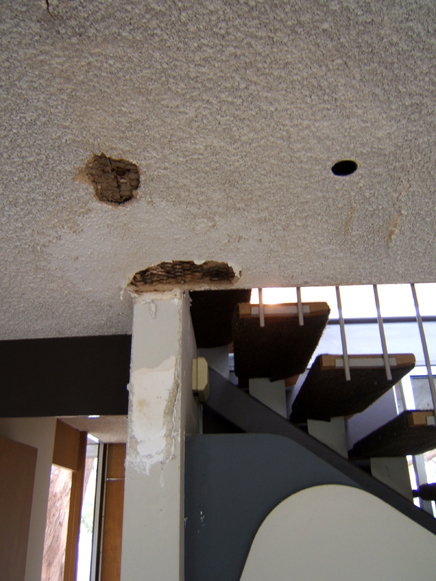 The State cut the world’s biggest university system’s budget and Neutra house started to leak from lack of maintenance money. “Only those, who have lived in a Neutra House, would ever understand how wonderful the daily satisfactions and delights are and how much this experience help to augment the joy of living. This especially the case in this house which is built on three levels. With the many glass surfaces, mirrors, pools that reflect trees and flowers, every step from room to room, stairway up and down, is an aesthetic and artistic experience, which I have the good fortune to enjoy, while I move about the house and watch the changing weather. We are not talking about restoring the house to its “full glory” here. The Research House was never glorious by calling attention to some expensive pristine materials or calling attention to the client’s opulent wealth. This house, as the name suggests, was a research house where Neutra used a lot of materials for the first time and like many architects do, took risks of new ways, using his own investment as the guinea pig. When you see an ordinary material like acoustical ceiling tile or textured stucco here and there, you don’t say how ordinary, but immediately get the idea that the architect was trying something new those days, or experimenting with building materials in their unintended uses. The real glory was in the very spirit of its occupants and creative lifestyle that made modern architecture desirable. Glorious was that simple living, surrounded by art and talent of the human spirit. Free flowing nature and air nurtured the occupants and ideas made the house beautiful. I assume, at the Research House, most materials were donated to Neutra Architects for trying. In 1963, an electrical fire destroyed the house. 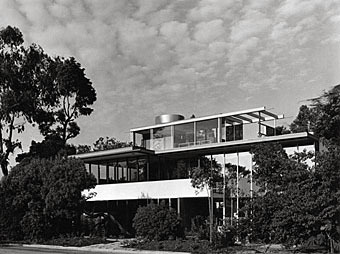 After seeing the debris a week later Neutra said, “It is all over, there will be no way to reconstruct this ruin.” But later the house was raised from its ashes with the design efforts of the son, Dion Neutra, and of course with the father’s careful watch. After Mrs. Neutra's death, the decay gradually became visible and impossible to hide. Rudolf Schindler became the new hero of the Austrian invasion and people started to forget about Neutra for fashionable correctness. The same community who raised hell over a building next to MAK protected Schindler House, knew nothing of VDL House' neighbors or didn't care. Absurd and campy cliches like "Neutra was not as good as Schindler" became a part of groupie conversations in archi-hipster parties. We are now a culture of ten minute propaganda that lasts for several years. Fashionable gossip creates heroes and zeros because it benefits someone somewhere in the background and nobody asks anymore questions. Watching the 2300 E Silver Lake Blvd. dissolve is a regretful development. You can help to save this cultural Landmark. By spreading the word and mobilizing the community. Tours of the house will resume on the 5th of April from 11-3pm and every Saturday thereafter. I was just reviewing photos I had taken there last week. Simply walking through the house reminded how wonderful the design of the house was. Transitioning from one space to another simply reminded me of how intimate the spaces really were. things fall apart. its scientific. orhan, you need to check out the neutra offices just around the corner on Glendale Blvd. Working in that space for a year made me grow to love neutra's humanistic spaces compared to Schindler's dictatorial materialism. Maybe MAPA can rally behind the SDL house. great. thanks for writing this orhan. i'm glad to see this being covered. it's a shame that a vital piece of los angeles architecture is falling into decay. also, i'm sure you're familiar with the vdl website that sarah's firm set up. more info there. cool -LA Curbed found your feature. maybe the masses will be mobilized! My recollection was that there was a technical reason the house could not receive a grant due to the fact that Dion is alive and is the credited architect even though he has no ownership rights to the VDL house, any truth to this? Anybody called on LACMA, the Getty. The Getty has already funded at least one major study of the renovation/restoration work required. The real problem is that Cal Poly Pomona has never funded the house, and in nearly 30 years since they were promised it and 18 years since they took possession of it, they have never managed to either integrate it into the ENV department's curriculum, program, or budget. And from the beginning, the Neutras didn't give the school enough money to cover the house's operating expenses and upkeep. When the University president sponsored a big school-wide priorities report for funding and cost-cutting in 2005, the ENV department itself ranked the Research House as one of its lowest funding priorities. Since then, nothing's happened, the operating funds have dwindled, the house has deteriorated, and only in the last few months have "urgent" fundraising activities started. If any of the people at Cal Poly Pomona actually give a damn about preserving the VDL House, they will push to have it sold ASAP to someone with the commitment and means to renovate it and preserve it properly. Anything else is a dereliction of their stewardship. As for whining about the "possible" loss of public access, that's bunk. Anyone who renovates that house properly will make it available for school and museum groups and will put it on whatever Silverlake Neutra Tours come up. Great job on the article Orhan! Good to see that there's interest in this issue. While it is true that the University considered "divesting" itself of the house, Cal Poly Pomona's ENV faculty all signed a letter of support to keep the house. Much more should have been done to maintain, to provide access and to integrate the house into the college's curriculum. We are now trying to do better. We have a plan to move forward, to rescue the house, but we need to first raise money. "You can help to save this cultural Landmark. Visiting the house with your family and friends and donating urgently needed money. Thank you for your kind attention..."
Lots of info on our fund raising team and efforts online -also tells where to send a check if you are so inclined. Tours will start up again Saturday April 5th from 11am to 3pm. Hope many of you will stop by. these articles about collapsing modernist gems appear so regularly. these are PRIVATE RESIDENCES ("mobilize the community! "), hardly the kind of place that many people had the opportunity to appreciate, inhabit, etc. If I of limited funds can only help turn one of them into a gallery bookstore with good coffee, which one should I pick? i hate to see this house going into private hands. 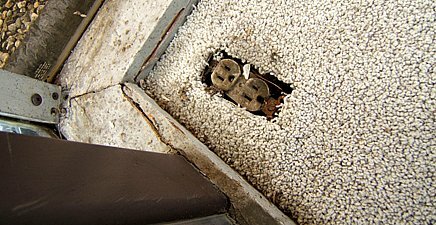 i am certain cal poly and vdl.org will do everything to keep the house and fix it. i just saw a j crew spring catologue shot in kauffman house and i rather see the research house remain in public hands and remain open to public. this is not just another beautiful neutra house. it has an historical significance and importance for being architect's active residence. it is like walking into a study model, seeing all the details that were used in bigger or different projects tried out there first. it is as important as the schindler house which is well protected. this feature is not an investigative journalism but an article to raise public attention to the house, i use a lot of my own emotions and visible demage to the house to get the point across. cal poly pomona is the only architecture school in california with considerable amount of students coming from low income communities and i'd be damned anybody who doesn't support that school in their endeavors. Cal Poly Pomona may be the architectural Harvard of the west, I have no idea, But judging from the school's apparent inability to plan for taking care of the house before they got it, their failure to fundraise for it since they got it, and their neglect or inability to maintain the house's physical condition over the years, it seems like a mistake for them to keep it. Not to mention that, whatever the faculty proclaim, the Dean of the ENV department has declared the House is a low fundraising priority, maybe even the lowest. As for the uniqueness of the building itself, is its historic nature impacted by the fact that it was redesigned and rebuilt by Dion in the 1960's? Schindler's Kings Rd House is a perfect example of what VDL is NOT: namely, an early--and largely intact--original design. It's also an example of what can happen when the right institution takes stewardship of an important property, though; the first time I went to Kings Rd, it was being run by Friends of Kings Rd or whoever, the well-meaning woefully underfunded non-profit who couldn't take care of the house. There was no way of knowing how long the house would survive deterioration and real estate development pressures. Obviously, MAK changed that and saved the house. Hopefully, the VDL House will get matched up to someone that can do the same. I agree with greg.org on all points. Those of you who want to maintain the house with 10 dollar entry fees and public/university management may need to reconsider. Those are good intentions but they will most likely lead to further destruction. It should be managed the same way MAK took over and handled Kings Road. On another note, the ground floor slab may be way beyond repair. From what I've hear the place needs far more than cosmetic fixing. The problems are structural and without those repairs all efforts are pointless. If anyone does fund the project then who would be opposed to dismantling the thing completely and rebuilding? As mentioned by greg.org it already is a rebuild by Dion since an electrical fire in the 60's. Why not do it again? Dion himself could oversee the project and maybe even get his office paid for the hard work. Wouldn't that be appropriate? A complete rebuild would definitely be cheaper, faster and more likely the only proposal that would attract funding from an organization such as MAK. Has anyone considered a proposal to completely rebuild? First of all, as an ex Los Angelino I would like to thank Orhan Ayyuce for writing this moving and eye opening article about one of LA's landmark buildings. As far as I can tell, I don't think selling or giving up the building would solve anything as suggested by some commenters. Organizations like MAK are not easily found and there is nothing wrong with donating money with specific condition that it is spent on the house. Instead of starting long and sometimes draining process of legal transfer of the state property, it would make much more sense to work with existing parties to resolve the problems regarding the VDL House. I think suggestions like complete re-building of the house or asking school to give up the deed are not very realistic and they are easier said than it is done. A better strategy would be fund raising efforts on community and state levels. This is a political issue as much as a cultural issue and much can be done working with existing organizations by letting them know about your interest in this house with stated historical and cultural value. On the co-steward idea, the college/ vdl fund raising committee is investigating this option. If you read the information on the Neutra-vdl website you'll see that this is one of the ideas being discussed. Our living space should not be separated too much or too long from the green world of the organic’ The immense foliage masses of the tropical jungle do not oppress us. as would the arid inorganic foreign properties of a moon landscape or an area in downtown Manhattan. tructure which I myself have often proposed. But we must articulate this large-scale communal habitation Into a multiplicity of better proportioned, “greened-over corners, balconies, and water terraces, webbing even the starkly patched concrete slabs with growing vegetation. Hydroponics seems to me to be a promising new technique whereby nutritive substances dissolved in water, perhaps even heated in winter, would be pumped upward from a carefully serviced central location. The fluid would flow into the receptacles of flower windows on many stories, and would support hanging gardens and roof terraces without the need for the services of a swarming army of plant tenders. One could “green over the highest massive building structures with Striking varieties of Ivy, for instance, like a two-storied Oxford college in former times. feminine aspect of our species that makes the mother of children so discriminating that she is able to invest even a household and dwelling place with personality. ...it does make for leaky roofs though. 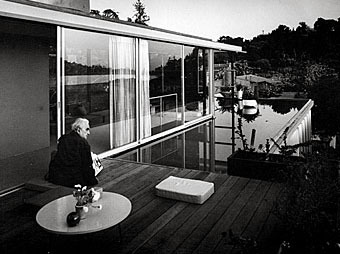 Long live Neutra. seems like the word is getting out there. The best visit I had to the VDL house happened when studying at SciArc. I visited with 2 friends. They had gone around to the back of the house while I stood there admiring the front. A middle aged lady pulls up in her 1960's 2-door and parks. She gets out and goes into the house. A minute later she pokes her head out the door and tells me Mrs. Neutra says I can come in and look around. I look left and right in vain for my friends, so I go in alone. Later I spotted them and got them inside also. While we climbed all over the house Mrs. Neutra on her cello and her visitor accompanying her on piano played music for us. Many years later while attending a UCLA extension course on LA Arch we visited many Neutra houses among others (Case Study #22, etc.) I met Richard´s son Dion. I helped him with an exhibition of his father´s work at USC, collected signatures for the renaming of Earl Court, around the corner from VDL house, to Neutra Way and helped on a house he was doing on some Caribean Island at the office on Glendale Ave, Silver Lake. I also had the opportunity to do a videotape interview with Regula Fiebel, Dione's sister and Richard's secretary. Heard from John Knight lately?